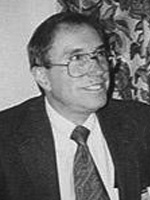 Gordon Gould had a short TV career in the 1980's. 07/01/1974 0112 Hurricane A couple take refuge from a storm in a secluded beach house, only to find themselves in the company of two strangers. 08/06/1974 0128 The Headstrong Corpse After his death, Lord Berly of Moreland is kept in an open crypt by his physicians in deference to his fear of being buried alive. When his body mysteriously vanishes, murder and mayhem become the key facets in this Gothic thriller set in 1874. 09/16/1974 0148 What Happened to Mrs. Forbush? The ghost of a sea captain's wife plagues an abandoned house by the sea, and the water nearby is haunted by the spirit of the captain. A frail child and his family are caught in the tempest. 11/11/1974 0172 Wave of Terror A more modern version of the classic Romeo and Juliet, with the story taking place in Hawaii. Disaster follows the couple as their marriage is strictly prohibited by their families who have a secret to hide. 12/02/1974 0181 The Dice of Doom A young gambler from the 1800s tries to outwit the Devil by using two special dice, thereby altering a predetermined fate he was bound to endure due to an ancestor's Faustian mistake. 03/27/1975 0246 The Velvet Claws A man talks to his counsellor and recounts the tale of his escape from a mysterious town full of people obsessed with cats. 04/28/1975 0264 The Phantom of the Opera Raoul de Chagny falls for the stunning Christine Daae as he he watches her perform in Paris Opera House. But he must pursue her through its backdoors and stage rooms while he his heart becomes heavy with the presence of a disfigured spirit. The spirit wields unimaginable power over the singer and Raoul must compete with him to win her heart and overcome her fears. 06/10/1975 0289 The Queen of Darkness A washed out actress is hired to masquerade as the queen of a remote country. She wonders if this is a one shot deal. 07/11/1975 0307 The Widow's Auxiliary When his boss invites him to join the local men's association, a young engineer is extremely flattered. What he doesn't know is that the club plans to use his mechanical skills for their own agenda; and it is up to the young man's wife to save him. 07/17/1975 0310 Nightmare's Nest In order to pursue his interests in peace, a reclusive scientist purchases a remote country manor. Little does he know that a malevolent spirit prowls the estate's grounds. 09/26/1975 0352 Assassination in Time A time traveling pair are tormented by their decision to save Abraham Lincoln from certain death; thereby changing history as we know it. 11/13/1975 0378 Home Is Where the Ghost Is In the midst of aiding a colleague in his desire to abandon his post, a scientist is haunted by the ghost of his dead wife. 12/03/1975 0389 Promise to Kill After learning that the killer's sentence was reduced to life imprisonment instead of the death penalty, a man plans to mete out his own brand of justice against the deviant that brutally raped and murdered his wife and daughter. 02/09/1976 0428 The Horror of Dead Lake Upon hearing of their inheritance, Claude and Polly Baxter are thrilled to be the proud new owners of Captain Doubloon's castle and its mysterious lake. Their pleasure turns to fear when they learn that the castle is home to Professor Micah, a demented embryologist crossing giant Venus flytraps with birds and their terror reaches fever pitch when they discover the creature that lives in Dead Lake. 03/10/1976 0445 I Thought I Saw a Shadow A scientist working on the development of an invisibility serum believes he has finally found it and uses himself as a test subject. However, things don't go as planned when instead of making him invisible, it separates him from his shadow. Once unleashed his shadow goes on a homicidal rampage that causes his estranged wife to fear for his sanity. 03/10/1977 0614 The Pleading Voice A teenage girl recovering from an illness hears a disembodied voice beg to be let into a ruined building on the property. Her father and their minister explore the ruins to learn the source of the voice. 08/17/1977 0696 In the Fog A shell-shocked World War I veteran gets lost in the fog and stumbles into a woman who is anxious because she will miss an appointment. He helps her to find her way home and she later turns up dead. 09/30/1977 0718 Trilby An arrogant hypnotist turns a depressed young woman into a popular singer. But she cannot sing nor remember her performances while she is not under the spell. Can fame remain the sole compensation for her fragmented life? 11/21/1977 0744 She An explorer and the son of his former co-worker journey to a distant island and find a mythic goddess who caused the death of the young man's predecessors. They also find an ancient queen who has waited hundreds of years to wreck revenge on the murderer of her lover. 12/16/1977 0755 The Ghost with a Knife Alleged to based on real-life incidents, this is the story of a family threatened by a knife-wielding spirit who kills their plants and repeatedly adjusts their thermostat. Ghost hunters try to talk to him and understand his strange behaviour. 05/15/1978 0833 Edmund Orme A young gentleman's amorous attempts are severely impeded by a spectral visitation every time he tries to propose to the lady. Her mother has some explanation. 07/21/1978 0868 The Locked Trunk A woman takes her revenge spree too far when she tries to get even with her sister who stole the man she had long cherished a crush on. She must pay a high price for it. 11/13/1978 0917 The Pilgrim Soul During World War II, an American nurse travels to England to offer assistance to the local hospitals. Her friendly and open nature charm the patients and this causes British Intelligence to suspect her of espionage. A savior comes in the form of the mortally wounded officer she has fallen for. 12/08/1978 0928 The Exploding Heart In the 1950's, while performing a complicated operation on his future brother-in-law, a young surgeon gets assistance from an unexpected source. 12/22/1978 0934 The Power of Evil A gambler residing in Hong Kong is plagued by the spirit of his past lover, and this time, she demands more than he is willing to give. 04/11/1979 0970 The Charnel House To discover the truth about her father's death, a young woman becomes a staff member in the rest home in which he resided. There she uncovers a horrifying and gruesome secret. 07/16/1979 0997 The House of the Dead Heart In order to view a supposed secret masterpiece painted by the great Leonardo Da Vinci, a college student travels to Sienna, Italy to visit the House of the Dead Heart. A clandestine romance blossoms between him and the owner's daughter. 08/01/1979 1002 The Goddess Caper While traveling in Europe, Twain encounters a woman who implores the famous author to assist in obtaining the release of her husband from a mental institution. He was committed for claiming that he had been the sculpturer of an ancient and revered piece of art. 01/02/1980 1044 Revenge Is Not Sweet A police detective becomes suspicious of the family's strange behavior and looks deeper into the death of a wealthy old man. 06/23/1980 1096 Life Blood In this tale of revenge and deception, an embittered scientist creates a life-like robot whose sole purpose is to destroy the life of his old rival. 07/28/1980 1104 A Ton of Gold In an expedition to search for the lost Indian gold of an obscure tribe, an archaeologist and his team set off into the desert of New Mexico. Before long, they discover firsthand the horrors enveloping the cursed gold. 09/24/1980 1121 The Murder of Caesar As plots to bring down his regime abound, the powerful Julius Caesar is cautioned to beware the Ides of March by the beautiful and loyal Portia. 10/27/1980 1130 The Gilbert Stuart Moved to pity of the elderly widow, a museum appraiser assigns value to an unsigned painting supposedly done by a famous artist despite believing it to be a fake. Before long, he begins to regret the wrongful appraisal and his purchase of the counterfeit. 04/01/1981 1179 Down the Garden Path When Machiavelli influences a young man to plead guilty to a crime he did not commit, it starts him along a path that will ultimately lead him to becoming history's most devious and cunning statesman. 04/10/1981 1183 The Empty Coffin A woman travels all the way to England after learning that her birth father perished. There she works to uncover the truth behind her childhood and the strange death of her mother. 06/08/1981 1208 Stranded After an unexpected accident, a duo of scientists is forced to make an emergency landing on a strange planet in a nearby solar system. The planet's inhabitants soon visit them. 08/31/1981 1238 The Musgrave Ritual The legendary Sherlock Holmes and Dr. Watson are thrown in the midst of a strange cult when they investigate the disappearance of two members of the Musgrave family. 09/25/1981 1245 The Judge's House After moving into the home of a mean-spirited judge, two young authors are haunted by a malevolent ghost. They exorcise the spirit with the help of the townsfolk. 10/09/1981 1249 Sleeping Dogs What prize awaits a French officer who vows to train the weakest link in their unit, and turn him into a super soldier. 10/12/1981 1250 The Five-Hundred Carats A local detective is convinced that the theft of the world's largest diamond is an inside job after it is stolen in Johannesburg, South Africa and tirelessly works to apprehend the criminal. 12/28/1981 1271 The Silver Mirror Sir Arthur Conan Doyle purchases a magic mirror that allows only him to look into the past. With it, he witnesses the events that took place in the life of Mary, Queen of Scots. 03/12/1982 1301 The New Man at the Yard The freshly established Scotland Yard requests the services of novelist Charles Dickens in order to unravel the mystery surrounding an undetermined case of murder or suicide. 04/02/1982 1310 The Naval Treaty The case of a mysterious document serves to reunite the esteemed Sherlock Holmes and Dr. Watson twenty years after their retirement. 05/05/1982 1324 Dreamers and Killers When her former lover becomes involved in several mishaps that nearly result in his untimely death, his ex-fiance becomes disturbed by how closely the accidents mirror her dreams! 07/14/1982 1351 The Innocent Murderer In order to escape prosecution and trial for the attempted assassination of Lincoln, John Surratt flees from Canada and makes his way to Liverpool, England. 10/01/1982 1376 Escape from Anzio After being shot down over occupied Italy during World War II, an army pilot and his companions must evade being captured by the German soldiers and make it back to neutral territory. 10/06/1982 1378 The Abraham Lincoln Murder Trial On trial for murder, circuit lawyer Abraham Lincoln works to ensure the freedom of a man wrongfully charged. Loosely based on the early years in the life of Lincoln. 11/25/1982 1396 The Reigate Mystery The brilliant Sherlock Holmes is tasked to solve a pair of almost identical cases that have resulted in murder. In AZ, in 1990, while I was doing some college theatre, our director had a buddy fly out from Broadway to star in Amadeus, as Salieri. I played Salieri's spy, Venticelli, and got many great scenes with him. Though I grew up listening to CBSRMT, it wasn't until years later when I realized the great Gordon Gould sounded so familiar because of his many stints in CBSRMT. We did 13 shows over 8 days and I missed an opportunity to ask all sorts of questions about the shows, the experience, Hy Brown...still kicking myself. I met, and worked with, Gordon Gould, veteran of many CBSRMTs. Unfortunately, did not realize why his voice was so familiar until years later, when I was listening to the shows on the internet. what was it like working with Gordon Gould over those 8 days? I listen to Old Time Radio on my ipod while I run everyday. I love the old episodes and could identify immediately his voice, along with Mandel Kramer (for some unknown reason), as actors whose voices I'd heard before. The have unique qualities to their voices and intonations, along with being exceptional actors. Nice to have the internet to see who they were and what they looked like. I'm green with envy that you got to work with Gordon Gould. Don't kick yourself too hard, you still have your memories. Thanks for sharing, got any Gordon Gould stories?? Gordon Gould was blessed by a voice any actor could hope for. Not only was he a stage actor, but he also recorded books for the blind for many years. I first met him in the late 60's when he participated in a NEA Artists-In-Residence pilot program for Delaware schools, of which I was coordinator for the project which included five other actors/dancer/writer. We have remained friends and I last saw him a year ago Sept. 2015 while in NYC on my way to Ireland. The voice is still there and as strong as ever at 86!